Distinguished by an enchanting presence, this set of two flute glasses makes a glamorous addition to any home drinkware collection. The sophisticated vessels offer a versatile and elegant way to share a bottle of any favorite celebratory drink--from pure white and golden champagnes such as Blanc de Blanc and Blanc de Noir to the delicate family of Pink and Rose champagnes, sparkling wines, and more--with friends, guests, or that special someone during a romantic dinner for two. Crafted of dazzling crystal with trumpet-shaped cups, the flute glasses feature an assortment of beautiful etchings that both represent champagne's signature bubbles and capture and scatter light with brilliance and clarity. Furthermore, they rise above slender, flared stems that ensure a comfortable hold when toasting, sipping, and socializing. Broad, decoratively etched bases contribute stability and aesthetic appeal while protecting counters or tabletops from condensation. For best results, hand-wash the glasses, rinse thoroughly, and air-dry on a rack or dry with a soft, lint-free cloth. 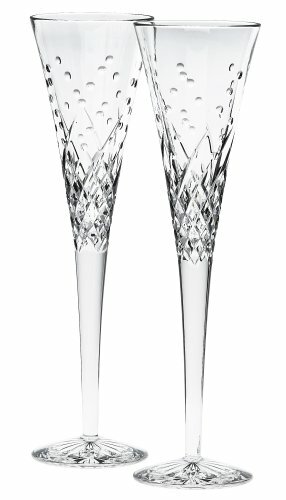 A luxurious yet practical addition to a starter or well-established collection, the set of two flute glasses makes a delightful and fitting wedding, anniversary, or other special-occasion gift.